Eating chili while following the keto diet is a bit different. I’ve made chili for years, but before now, it always included copious amounts of beans. If you’re eating keto, beans have way too many carbs to include in chili. 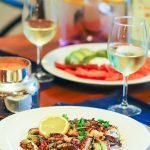 They also contain lectins which are highly inflammatory. As much as I’ve loved beans in the past, they are now out. Enter my latest recipe for keto carnivore chili, also great for those following Whole 30 (except sub the beer with a cup of water). 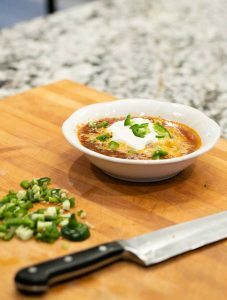 This keto chili recipe was born out of what I had in the freezer and a great sale at Kroger. Ground beef and diced chuck are pretty typical chili ingredients. But then I had some short ribs frozen! What a revelation. 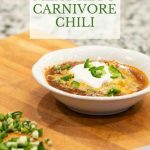 The combination of these three types of meat for a delicious keto chili is amazing. Triple meat keto chili is a carnivore’s delight. I actually like this version better than any I previously made and that’s saying something! I’ve been making and eating chili for a very long time. My love affair with chili started when I lived in Texas as a young girl. Then I moved to northern Kentucky and got ridiculously excited when I discovered there were whole chains of chili parlors there. Gold Star and Skyline Chili…I couldn’t believe there were entire restaurants devoted to chili! Unfortunately, my excitement was short-lived. After visiting a Skyline I learned this chili was nothing like what I was used to in Texas. Cincinnati chili is a sweet chili with some unusual seasonings served over spaghetti noodles. Definitely different than Texas chili and most certainly an acquired taste. 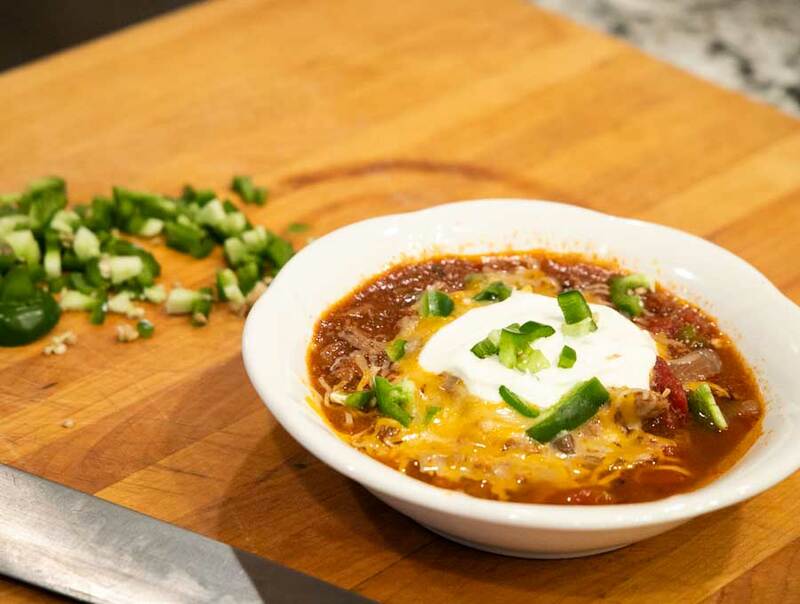 You can, of course, make chili on the cooktop. However, the crock pot is perfect for chili. Slow-cooked and ridiculously simple. 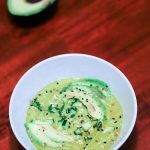 Take five minutes to put it in the crockpot before you leave for work in the morning and come home to a delicious and super easy home cooked keto meal. 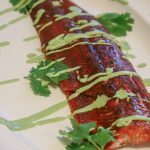 I tested this recipe using the laziest method possible. Usually, when I make chili in the crockpot, I brown the diced chuck and the ground beef separately. Then I add the diced chuck to the tomato mixture, but not the ground beef yet. The ground beef typically goes in only for the last hour. This process of browning the meats and leaving out the ground beef for most of the cook time ensures the chili has more texture and chew. The spices are on the mild side. I’m known to eat VERY spicy food, but I don’t want to burn your face off. Feel free to add or subtract heat by adding more spicy chili powder or cayanne if you’d like. UPDATE: Becasue this recipe was accepted to compete in the 15th Annual Findlay Market Chili Cook off sponsored by Gold Star Chili on January 27, 2019, I tested a variation to make it a little spicier. Replace the regular chili powder with all hot chili powder and add 1 tablespoon of chopped habanero, about 1 pepper. While this isn’t a no carb version of carnivore chili (because I LOVE tomato flavor) it’s still very low carb at about 7 net carbs per large bowl. If you want to make this closer to no carb carnivore chili, try cutting out one can of the diced tomatoes. While the lazy method does produce a slightly different texture, it’s still delicious chili. Try both methods and see which you prefer! Three types of meat make this Keto Carnivore chili extra delicious by incorporating different textures. Add all ingredients except the meat to the crockpot. Stir to combine and taste to adjust spices to your liking. Add all meat and stir to combine. Take out the short ribs and remove meat from bone. Dice short rib meat and mix back into chili. 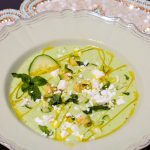 Serve with sour cream, cheese, avocado, diced raw onion, jalapenos or whatever other toppings you like. 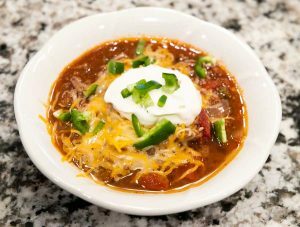 For a spicier version of this chili, replace the regular chili powder with all hot chili powder and add 1 tablespoon of chopped habanero, about 1 pepper. Add 2 tablespoons chipotle in adobo sauce and 2 chopped chipotle peppers.